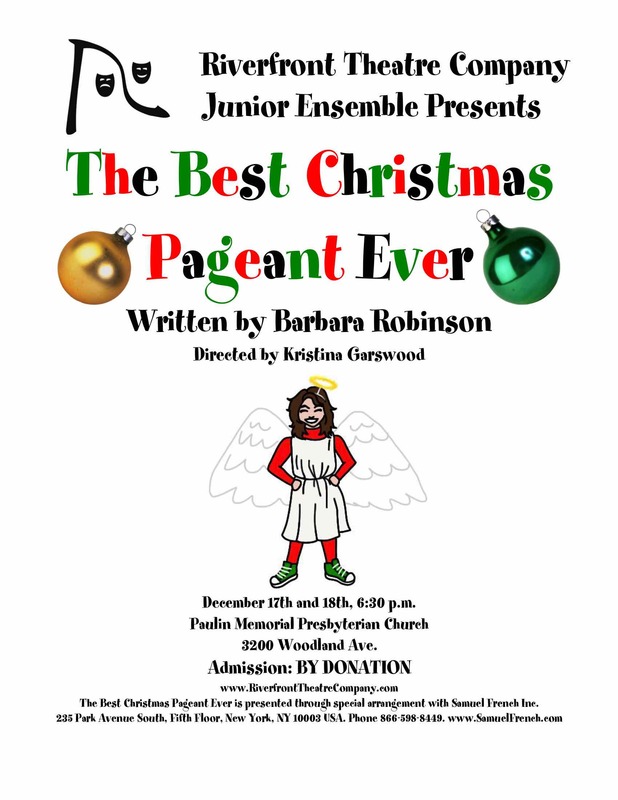 On December 17th and 18th, our host church, Paulin Memorial Presbyterian Church, will be the location where our Juniors will perform the play they have begun to produce, The Best Christmas Pageant Ever. In our programme, we start with kids between the ages of 6 and 10. We work with them for two hours each Saturday morning through the first part of the season, before incorporating them into the full group for rehearsals with the Seniors for the spring musical. This year, we have twenty Juniors. Of that group, only five are brand new to Riverfront, though one is returning after being away for a few years. The overwhelming majority of our students from last year returned, eager to get going with a new play. The Best Christmas Pageant Ever is going to be a challenge for them; it’s one of the longer plays we’ve tackled with the Juniors, and one part in particular, that of the mother, has a HUGE number of lines for a young performer to learn in just under three months. With the assistance of Melanie Tennant, one of our Seniors who has volunteered to help me direct the Juniors this fall, and all the parent volunteers who stay to help with some of our younger (or more wiggly) students, we look forward to shaping this up into a lovely Christmas performance for our friends and family. Our Junior production is a chance for the little ones to really pull something together on their own without any pressure from more experienced Seniors, and the production that we put on stage is always a relaxed performance for audiences with families and young children. We don’t charge admission for the Junior show – it’s entirely by donation, as is our Riverfront Bake Sale. What we’ve noticed over the years, though, is that the attendance and appreciation of our Junior production goes a long way toward paying for the Senior show! So we always expect the support of the Senior students, because we tell them that they wouldn’t be operating without the help of the little ones! We certainly welcome your gently encouraging presence at our two performances of The Best Christmas Pageant Ever in December. It’s always been a very popular story, and I know that our students are excited to be bringing it to life for the first time at Riverfront Theatre Company! Previous: Previous post: The Big Jam – and TWO Casts Selected! Next: Next post: Our Halloween Bowlathon Is Coming Up!